Nesting: Why is this bird face down on her nest? 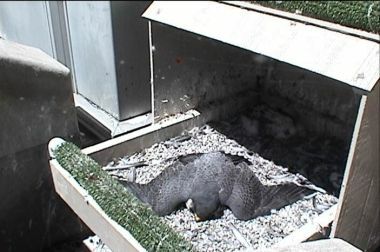 Question: Why is this peregrine falcon lying face down on her nest? Many birds sunbathe including robins and mourning doves. There are various theories as to why they do it – perhaps to eradicate parasites, perhaps to straighten their feathers, perhaps to spread the preening oil in their feathers. See Chuck Tague’s blog here for more information on sunbathing (even swallows sunbathe). We once came home to find a raven (we think) sunbathing on the roof of our house…we have a section that slopes down fairly steeply over our living room and ends about 8 feet above ground, so we could see the bird really well. It was very strange to see it spread out like that on the roof (it was pretty big). I freaked out when I found a dove lying like that in my yard. I cried for a while. Then I came here to look it up. Thanks for whoever answered this question. I just saw it get up and fly away. That makes me feel better. Like humans and many other animals, birds get vitamin D from sunlight.